If you buy ETFs, you need a brokerage account. In the old days, one way discount brokers made money was by paying you less on your idle cash in the sweep account. Vanguard paid the highest rate on its money market funds. Others paid less. In the low interest rate world, this difference went away. Money market funds and bank sweep accounts everywhere pay practically zero. Commissions on ETF trades aren’t that much different either. Vanguard ETFs trade commission-free at Vanguard. Schwab ETFs trade commission-free at Schwab. Fidelity has 65 iShares ETFs commission-free. TD Ameritrade offers 101 ETFs commission-free. Even when you must pay commission for a trade, the commission cost is really low. Vanguard charges $7 a trade, Fidelity $8, Schwab $9, TD Ameritrade and E*Trade $10. Unless you trade a lot, $7 a trade versus $10 a trade makes very little difference. What matters is what brokers pay you to hold your money. Vanguard doesn’t pay to attract your money except it lowers the commission to $2 a trade when you have $500k. Fidelity, Schwab, TD Ameritrade, E*Trade, and Merrill Edge all pay a big signup bonus up to $2,500 to have you as a customer. When I moved some money to TD Ameritrade last year, I received a bonus. I tried different tools offered by TD Ameritrade. They are very nice. Year-end summary and tax reports are also great. I got a few calls at home from the local branch asking if I needed any help. I said no, but it’s good to know if I have any problem with my account I could go there and talk to someone. I had no problem with my account whatsoever. If someone wants a broker for investing in ETFs, I would recommend TD Ameritrade. Obviously for the same amount of trouble it makes more sense if you are transferring a larger amount. E*Trade will charge $60 when you transfer out. Fellow blogger indexfundfan gave me this tip: before you mail in the asset transfer form, send a secure message to customer service to confirm that the account is tagged with the promotion. That way if for some reason the bonus doesn’t come as expected I will have something on the record. Good point. I don’t expect any problem but a system glitch can happen. 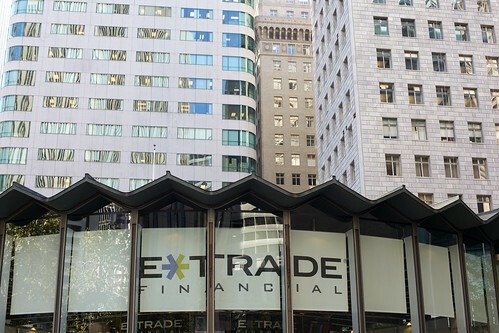 The money must stay at E*Trade for six months. I’m sure E*Trade will do a good job holding the assets and processing dividend distributions. When I transferred to TD Ameritrade last time, the cost basis information also transferred with the assets. I expect the same to happen this time. It’s the law now. The broker you use to hold your money does not have to be the broker you use for new purchases. It’s OK to have two brokerage accounts or two IRAs at two different places. If you like open-end mutual funds, keep buying them at the place you prefer but hold your static pile in ETFs. An ETF is the same ETF at any broker. You have to hold it somewhere anyway. Rebalancing touches maximum 10% of your money because it takes a 20% swing in the market to trigger a 5% rebalance. Let the broker that pays you hold the other 90%. Our hypothetical couple in the "double the bond yield" movement decided to do this. They transferred assets in their IRAs to a new broker. Each of them will receive a $1,000 bonus (remember they have $1 million in assets). After this move, they are just a hair shy of the original goal of doubling their bond yield without more risk. I’m confident they will be able to achieve their goal shortly. Before you moved the money to TD last year, did you have it at Vanguard in ETFs? I don’t have a large enough balance at the moment that these deals would work, but I’ve been using Vanguard’s index funds and not ETFs. Hypothetically, would this deal still work for me? I had them at Wells Fargo Advisors (“WellsTrade”) in ETFs. Vanguard mutual funds can be converted to ETFs without tax consequences. As mentioned in the article, new money can still go to Vanguard mutual funds. Does TDA charge for transferring out? Do brokers have different charges for partial vs. full transfer out? It would be nice to have a comprehensive list of these fees at major brokers (hint hint), as this info is a big hard to find online. TDA does not charge for transferring out if you have $100k (Apex customer). With a lot of brokers, if you tell them that you will be charged for transferring an account to them then they may reimburse you the fee. I transferred an account from Edward Jones to TD Ameritrade and was reimbursed the Edwards Jones fee in total by TD. I am just trading from ETrade to Vanguard because I could not buy Vanguard funds from ETrade. I asked my broker at ETrade and he confirmed that. He also told me that if I transferred part of my account I would be charged $25. not the whole $60. So I left a little play money in the ETrade account. Thank you to JN for the info about getting a reimbursement. I’ll ask my “concierge service” adviser if he can do that for me at Vanguard. I noticed that you have to have transferred the funds to ETrade by 2012 to get the incentive money. Is that the case? Eugenie ~ Vanguard is not going to reimburse you any exit fees. if you don’t wan to pay exit fees and don’t have many capital gains, just sell your funds and transfer to your bank account and then transfer to vanguard.